While manufacturers commonly bleach and process commercial flour, you can control every step of the milling when you grind your own flour. Home grinding lets you decide on a coarse texture for rustic whole-wheat breads or a finer flour for tender baked goods. 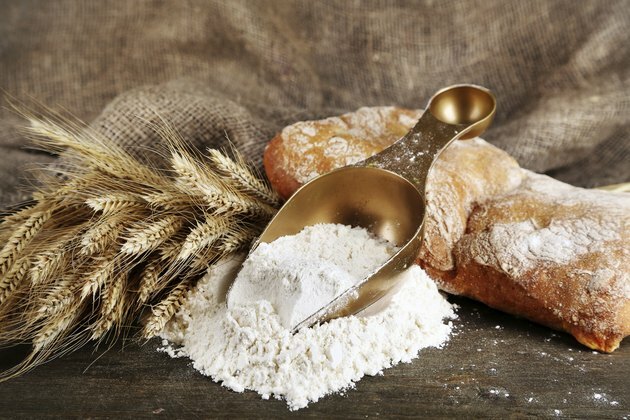 Because flour you grind yourself retains its natural bran coating until you decide to grind it fresh, it has a more pronounced flavor than commercial flours do. Each grain of wheat consists of three parts: the bran, the endosperm and the germ. During commercial processing of refined flour, manufacturers remove the outermost coating, the bran. While subtracting the bran creates a finer texture in the finished product, it also removes most of the grain's healthful fiber. The endosperm contains the bulk of the wheat kernel's carbohydrate content; it's where the seed stores its energy in the form of starch. The nutritious wheat germ contains the highest concentration of niacin, folate, thiamine and vitamin E. Like the bran, it is removed during commercial production, but grinding at home preserves this portion of the seed. Stones were the earliest tools for grinding wheat into flour, and hand grinders still work on the same principle. Hand-cranked grinders crush wheat kernels between textured plates or rollers to produce powdery flour. For small amounts of flour to make a roux or thicken a sauce, you may find a hand grinder convenient. Hand grinders also offer the advantage of needing nothing but muscle power to function. The large amounts of flour that multiple loaves of bread require may necessitate an electric grinder. Powered grinders allow you to produce large volumes of flour quickly. Raw wheat grinds best when the kernels stay dry, so store whole-wheat grains in an airtight container until it's time to grind them. Pour the kernels into a sifter or fine mesh strainer and shake them before grinding to remove excess dust. Your grinder's instructions will detail how to load the grain into the grinder; follow these instructions to get the best results from your particular mill. Use a large enough container to catch the flour as it pours from the mill to avoid waste. After grinding, sift the flour through a fine sieve to remove hulls and chaff that may have found their way through the mill. The term "wheat" encompasses a broad variety of seeds with a number of specialized uses. The higher gluten content in red wheat makes it elastic enough for bread and pizza dough. White wheat has a soft texture and a mild flavor that suits it well for cakes, biscuits and cookies. Vary the taste of the raw wheat by toasting it in the oven for a few minutes before grinding. Aged kernels taste less sweet than younger wheat, so allowing your wheat to age changes its flavor.